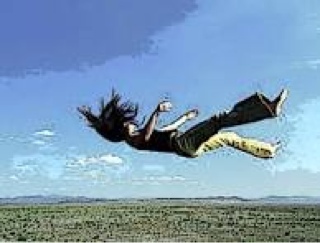 GET OUTTA UR WAY: "AND I'M FREE FALLIN,I'M FREE FALLIN"
"AND I'M FREE FALLIN,I'M FREE FALLIN"
"Free Fallin" is the opening track from Tom Petty's 1989 solo album, Full Moon Fever. The song was written by Petty and his writing partner for the album, Jeff Lynne. Although these guys wrote "Free Fallin" several years ago the title perfectly describes my life experience for the past several years. You see I've been in a perpetual free fall. Remember ALICE'S ADVENTURES IN WONDERLAND by Lewis Carroll? "The rabbit-hole went straight on like a tunnel for some way, and then dipped suddenly down, so suddenly that Alice had not a moment to think about stopping herself before she found herself falling down a very deep well. Down, down, down. Would the fall NEVER come to an end! 'I wonder how many miles I've fallen by this time?' she said aloud. 'I must be getting somewhere near the centre of the earth. Let me see: that would be four thousand miles down, I think—' (for, you see, Alice had learnt several things of this sort in her lessons in the schoolroom, and though this was not a VERY good opportunity for showing off her knowledge, as there was no one to listen to her, still it was good practice to say it over) '—yes, that's about the right distance—but then I wonder what Latitude or Longitude I've got to?' (Alice had no idea what Latitude was, or Longitude either, but thought they were nice grand words to say. )"[Lewis Carroll]. During my free falling journey I have like Alice have had some bizarre experiences. However, each time when it feels as if I'm going to hit the bottom and splatter I start falling again. In 1992 I told God as I still do today: I want to know what you know; I want to hear what you hear; I want to see what you see; I want to feel what you feel.I had no idea the process of entering a deep realm of intimacy with God meant I had to continually fall backwards down a rabbit hole. So here I am today writing this blog falling even deeper down the rabbit hole. So I'll ask are you "Free Fallin?" And if so how far down the rabbit hole do you want to go?